Icaros Shell Extensions is a collection of lightweight, high quality, Windows Shell Extensions. 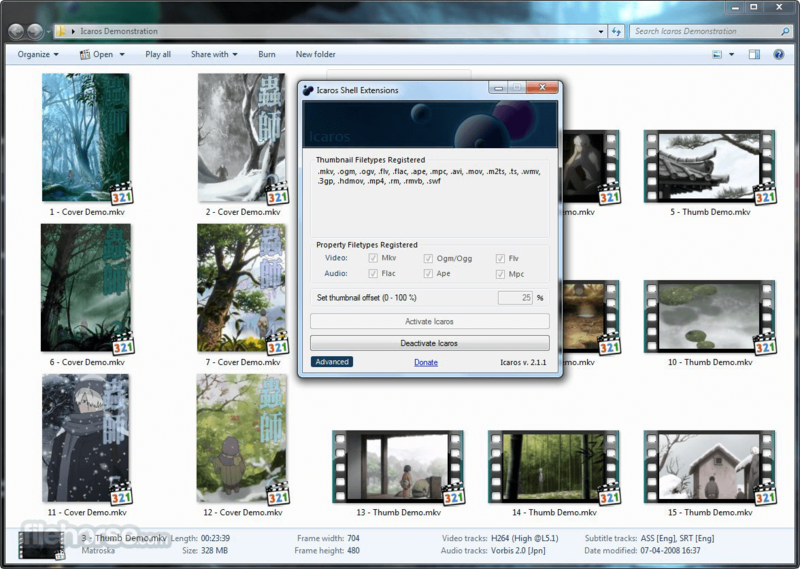 Icaros can provide Windows Explorer thumbnails, for essentially any video media format supported by FFmpeg, this includes popular filetypes such as Mkv, Flv, Avi, Mp4, Mov, Rmvb, M2ts, Ogm etc. Besides the FFmpeg supported filetypes, Icaros also contains custom parsers, which can produce Cover Art thumbnails for Mkv, Flac, Ape, and Mpc files. Icaros Shell Extensions also provides Windows Explorer properties for the following popular filetypes: Mkv, Flv, Ogm, Ogv, Ogg, Flac, Ape, and Mpc.